We find it hard to picture a more romantic setting than the remote Scottish Island of Colonsay. Perhaps that’s why, in 2016, husband and wife team, Finlay and Eileen Geekie, left their home of 30 years in Oxfordshire and moved there. Taking the opportunity to combine their love of gin with their desire to contribute to the economy and community of this wild island, they created Wild Thyme Spirits and started producing the award-winning Colonsay Gin. 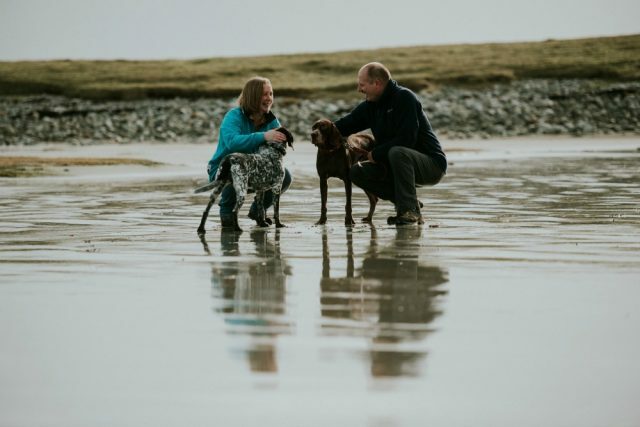 Finlay and Eileen are also keen to share the wild beauty of Colonsay with others, so they have created the Gin Lover’s Retreat, a chance to stay in luxury surroundings, take in the Colonsay experience and sample a large selection of gins. We asked Finlay to share some of their story with us. We met on day one at University in Dundee back in 1979. Eileen was studying Business Studies and I was studying Architecture. We both got placed in the same student accommodation. Our interest in Gin was sparked by visiting Junipalooza a few times and going to places like the Bombay Sapphire Distillery, both of which we believe are the best of their kind currently in the UK. We met Claire and Martin from Rock Rose at one such Junipalooza and after a great chat with them, we decided that we could try and do something similar. Further workshops on how to set up a distillery followed. Neither of us wanted to retire when we moved up to the island in 2016, so we formed WTS and gin it was! In our previous working lives down south, and in the hustle and bustle of a hectic lifestyle, quality time together was often hard to come by as our respective work and travel diaries hardy ever seemed to be co-ordinated. Now we have loads of time together as we work towards a common, mutually beneficial, goal. A combination of dog walking and enjoying the beautiful island we live on comes top of that list. Visiting friends and catching up with family on the mainland also makes a nice break from the gin routine. No specific business plans other than to join in the social media frenzy that will no doubt be created! We’ll just go for a nice walk along Kiloran Bay and maybe sip a nice wee Kiloran Waves cocktail when we get back!